Who needs to calculate BMI? But first, what is BMI? Body Mass Index (BMI) is simply a measure of body weight relative to height. It's of much more use to sedentary folks, than those who are already fit. In fact, I seldom pay much attention to mine. But if you're like Al, and have allowed life to dictate, it might very well be that you find yourself out-of-shape. If so, it's probably wise to sit up and take note. Body Mass Index is 'meant' to indicate whether or not you're maintaining a healthy weight, based on your weight-height ratio. It acts as an arbitrary predictor of the risk of disease and death. As the CDC’s Division of Nutrition, Physical Activity points out, "BMI can be used to screen for weight categories that may lead to health problems but it is not diagnostic of the body fatness or health of an individual." BMI is intended for use by both men and women, although it does have limitations (as we'll discuss below). The formula was created by Belgian Mathematician Adolphe Quetelet during the 1830’s. It proposes an 'index' by taking an individual’s body weight and dividing this value by the person’s height-squared (kg ÷ m2). Body Mass Index can also be determined by means of a chart, like the one based on the World Health Organization (WHO) data (see below). It shows how to determine BMI as a function of weight on the X (or horizontal) axis, and height on the Y (or vertical) axis. The contour lines indicate the different BMI values, and the colors show the respective weight status categories. Whereas BMI is a measure of weight relative to height, waist circumference measures abdominal fat (risks increase in men with waist measurements above 40 inches, and in women whose waist measurements exceed 35 inches). Combining these values with information about a person's additional risk factors, yields the inherent risk for developing obesity-associated diseases like high blood pressure, high cholesterol, heart disease, stroke, cancer and/or death. Although the Quetelet formula has met with criticism, it is widely used to classify conditions of underweight, normal, overweight and obesity in adults, and as a predictor of the risk of ill-health and/or mortality. BMI continues to be broadly recognized as a body fat assessment method, most likely due to its ease-of-use. However, rather than a consistent accurate measure, it provides more a rough means of estimating adiposity (or 'fatness') and in identifying trends of sedentary or overweight individuals (these groups represent narrower margins for error). BMI is decidedly less accurate when applied to athletes, who invariably weigh more due to higher levels of muscle mass. The BMI formula merely takes body weight into account and does not discern between fat and muscle. WHO has used the BMI as a standard means for observing obesity statistics since the 1980s. In the US, it is deemed a satisfactory tool in for measuring inactive individuals, despite its limitations in defining adiposity. The medical world, in particular, continues to calculate BMI as an aid for assessing the risk to health, and of increasing body size. Furthermore, most private health insurers in the US utilize BMI to determine cut-off points for determining coverage or premiums. According to WHO, BMI values are neither subject to age nor gender. However, they may not relate equally to levels of 'fatness' in different populations (certain population groups in Africa, Asia and North America) as a result of differing body-proportions. Also, BMI may not accurately reflect the levels of 'fatness' of people with builds falling far outside the average. In terms of body type and levels of muscularity (referring to somatotypes), Mesomorphs usually have medium builds, while Ectomorphs and Endomorphs would be the lighter and heavier diversions from the norm. As mentioned, physically active individuals (especially sportspersons) will tend to have BMI levels of 'overweight' or even 'obese', due to their higher levels of lean mass. BMI categories also fail to account for varying proportions of fat, bone, cartilage, water weight etc. To calculate BMI may be useful for untrained everyday people. It will, however, tend to overestimate body fat in athletes – or in those with higher muscularity. On the other hand, it may underestimate body fat in older persons or those who have lost muscle mass. Due to growth and differing maturation rates, a modified BMI compares heights and weights against growth charts – which also consider gender. This index is known as the BMI-for-age percentile (for children 2-19 years of age), and reflects BMI as compared with boys and girls of the same age. Aren't there more accurate ways to assess body fat? The answer to this question: it depends on your health and fitness needs. It matters far less if you're an out-of-shape middle-aged office worker (who's just curious), than an avid physique contestant (who wants to go places). As covered on the Body Composition page, better body composition alternatives definitely do exist. They are of particular importance to professional athletes and bodybuilders, who logically need much more accuracy. This crowd certainly doesn't care for the medical predictive component from the assessment. Instead, they simply want to know their body fat level as a percentage. In fact, chances are these physically active sportspeople might not even know their BMI. I certainly don't remember mine. So we know that BMI is at best a predictor of health, and that it's mostly of concern to people who are in poor (or less-than-adequate) health – like Al – perhaps. Like you really need to calculate BMI to know whether you're overweight and unfit–or not! But for the fitness buffs who go to great lengths to 'get' and 'stay' in optimal physical shape – we need to look beyond BMI. 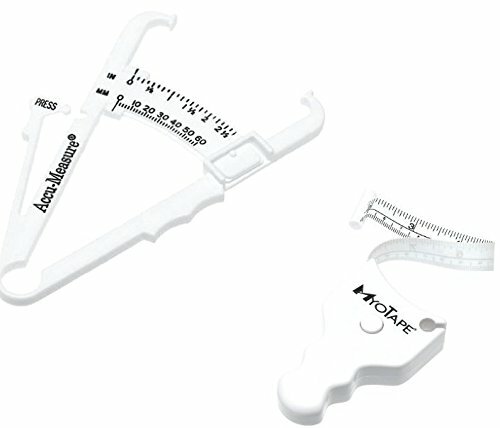 The most practical and affordable method for testing body fat composition is the caliper and skin-fold test method (as shown here using the 'Accu-Measure' tool). It measures subcutaneous fat levels from among multiple sites on the body. I used it successfully in this way during my first transformation. However, with experience, I now find that only the suprailliac measurement (about an inch above the hipbone), works just fine in giving me the indication I need. The Air Displacement Plethysmograph (ADP), otherwise known as the Bod Pod (bottom left). Although considered less accurate, Bioelectrical impedance analysis (BIA) is another commonly used method (top right). With consistency and good practice though, the skin-fold caliper method remains the simplest and most affordable solution for people like Al, who's main interest is in functional fitness and a firm athletic build. The medical establishment generally acknowledges some failings of BMI assessing, due to the respective formulas' reliance primarily on weight and height as input data. These BMI formulas also do not consider the distribution of muscle and bone mass, and therefore tend to overestimate adiposity in those with higher lean body mass like athletes, while underestimating adiposity in those with less lean body mass, like the elderly. At best, the BMI serves as a guideline, but cannot match the accuracy of the more thorough body composition tests we talked about. In my view, BMI should be used only as an indicator – and not to replace the professional opinion of a medical practitioner. Nonetheless, BMI provides a rough estimate to individuals about whether their health is at stake – or not. Don't get hung up on the numbers! Although the mirror, the bathroom scale and the 'fit' of your clothing aren't going to tell you how long you still have left on planet earth – they are your most reliable methods for gauging fitness and progress – assuming that you're being responsible and working out. But before you can expertly critique your own condition, you've first got to get fit. Having an idea of your BMI is really only relevant to you if you're inactive. However, if you've decided to work towards a body transformation goal (and I'm really hoping you are), then your best bet is to buy a set of skin-fold calipers to help you more accurately measure and log your body stats in conjunction with the BMR-TDEE calculator. By the time you complete your transformation, you'll be fully acquainted with your body's tendencies – and what you need to 'do' and 'eat' to stay that way. You can then shelve the measuring, monitoring and tracking, because you'll already know what you look like at varying body fat percentages. Once your life is changed (for the better), you (like me) won't need to pay any attention to your BMI.